“Is not Paul making the same point [Romans 2]? Not once in this passage does he mention everlasting torment. Immortality for him is always God’s gift to the saved, as are incorruption, glory, honor and eternal life. Like Jesus before him, Paul freely borrows from the Old Testament’s prophetic vocabulary. Also like Jesus, he adds to the Old Testament picture---not gory details of unending tortures, as did some of his contemporaries and many of his successors, but the shining, single beam of the gospel. Illuminated most brightly in that light is the figure of Jesus Himself. 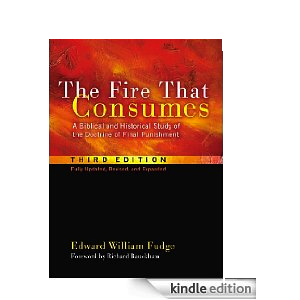 Jesus, not lurid details of conscious torment, is the contribution the New Testament makes to the Old Testament’s apocalyptic literature” (Edward William Fudge, “Romans 2:6-11,” from The Fire That Consumes: A Biblical and Historical Study of the Doctrine of Final Punishment, Third Edition. Eugene: Cascade Books, 2011). I discussed (to some extent) the fact that the Greek word for “destruction,” phthora (and its verb, phtheiro) refer to the destruction or ruin of a number of things: house, reputation, virginity, food, etc. Still though, when one uses the word “destruction” or “ruin” as regards these various contexts, there are differing connotations that the word provides. For example, the destruction of a house is not the same as the wasting away of food. This is the key to the debate between traditionalists and annihilationists: while annihilationists hold that the word “destroy” with regards to humans indicate that humans are destroyed like a house, traditionalists disagree. Why? Because the Scriptures themselves show us that man is worth more than the animal kingdoms and other natural elements. While the Lord used the dust of the ground to make man, the Lord placed His image upon man and also gave him intellect and dominion over the earth. The natural elements could not provide those things; God Himself provided them because man was the crowning glory of His creation. “...the righteous judgment of God, who will render to each person according to his deeds; to those who by perseverance in doing good seek for glory and honor and immortality, eternal life; but to those are selfishly ambitious and do not obey the truth, but obey unrighteousness, wrath and indignation. There will be tribulation and distress for every soul of man who does evil, of the Jew first and also of the Greek, but glory and honor and peace to everyone who does good, to the Jew first and also to the Greek. For there is no partiality with God” (Rom. 2:5b-11, NASB). Paul mentions a few words to describe the end punishment of the wicked: (1) “wrath,” (2) “indignation,” (3) “tribulation,” and (4) “distress.” A good way to determine Paul’s words regarding the ungodly (unbelievers) is to examine the meaning of these 4 words Paul uses. “Wrath” means “extreme anger.” “Indignation” refers to “anger or annoyance provoked by what is perceived as unfair treatment.” “Tribulation” refers to “a cause of great trouble or suffering.” “Distress” refers to “extreme anxiety, sorrow, or pain.” From these four words alone, we can tell that God will have “extreme anger” towards the ungodly; God’s anger will be provoked by how wrongly the ungodly treated the Lord by not believing in Him; the ungodly will face great trouble and suffering, and will suffer from extreme sorrow, pain, and anxiety. Do these four words allow us to conceive of the final punishment of the ungodly? Yes. Look at the words “tribulation and distress.” Do these words not indicate great suffering, extreme sorrow and pain? Does this not match Jesus’ words in the parable of the Talents (Matthew 25:30)? Jesus Himself said in the Parable that the end would consist of “weeping and gnashing of teeth”---synonymous for both emotional and physical torment, both of which are forms of conscious torment. So, again, I ask: how does this differ from what the rest of the Scriptures teach about the end? If anything, it doesn’t teach that the end is “unconscious” for the wicked. How can the end contain “tribulation and distress” for the wicked unless they consciously experience this end? If they are annihilated and cease to be (as Fudge believes), then how can they experience “distress” (as in Romans 2), “torment and unrest” (Revelation 14:10-11), and the worm not die nor the fire go out (Mark 9:42-48), if they are not conscious in the experience? This is where annihilationist theology seems somewhat absurd. There is another point to be brought out about Fudge’s quote. However, I will save that for my next post. Stay tuned.